From the Surf Coast and the Great Ocean Road to the Geelong CBD and Bellarine Wineries, our Estate has many conference activities close by for your next visit. No trip to the Geelong region is complete without a trip to one of the world’s most famous surf beaches. Bells Beach is the home of the world’s longest continuously running surfing competition and a great place to catch some waves while in town. Past guests have even braved the icy waters for an early morning surf before heading into a long day of conferencing! While the Surf Coast is known for its beaches, it also hosts two of the finest golf courses in Australia. The Barwon Heads Golf Club and 13th Beach are award winning courses that golf lovers simply must visit. Where to start? Take a walk along Geelong’s picturesque waterfront and while you’re there see how many of our famous bollards you can find! There is over 100 of these unique characters, who each represent a part of the city’s history. Admire the historic Carousel, built all the way back in 1892 and was restored over four years in the late 1990’s. Adventure down to Eastern Beach, Geelong’s much loved Art Deco masterpiece. The boardwalk surrounding the swimming enclosure is the perfect setting to take that Instagram worthy picture of the waterfront precinct. If all that walking has tired you out, there is no shortage of restaurants, cafes and bars for you to refuel at. Little Malop Street is a foodie haven, featuring some of Geelong’s hottest venues such as Pistol Pete’s – a Southern American and Blues themed restaurant, Geelong Cellar Door – a sophisticated wine bar offering a comprehensive selection of local wines, craft beers and ciders; and Armageddon Cake – a truly quirky and kitsch dessert bar. If you really want to treat yourself while in Geelong – look no further than Igni – voted Best Regional Restaurant by Gourmet Traveller two years running. A popular destination located just outside of the Geelong region is our Bellarine Peninsula. 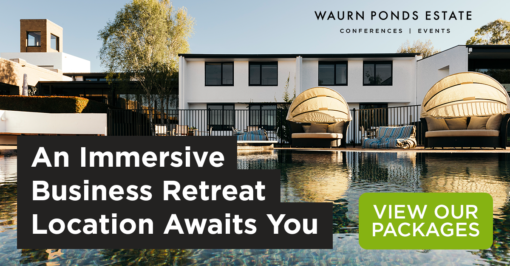 Well-known for its wide variety of wineries and remarkable food, just a 30 minute drive from Waurn Ponds Estate, it’s the perfect destination for your conference activities or tour. Allow your team to explore the vast properties, unforgettable views and delicious wines. Some hot spots include; Scotchman’s Hill Winery, Jack Rabbit Vineyard, Leura Park Estate and Oakdene Estate. Each with its own unique style and superb atmosphere. If you would prefer winemakers to join you here at the Estate to conduct a tasting for your team get in contact with us today to find out how.